The reviewer obtained a copy of the book from her local library. We're partnering with Kid Lit Frenzy to encourage people to read more nonfiction picture books this year. 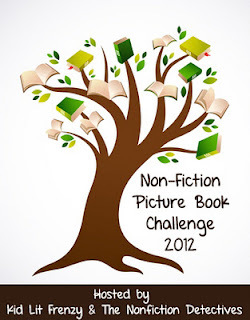 Read more about the 2012 Nonfiction Picture Book Challenge (#nfpb2012). Children are naturally curious about the world around them. Many kids love to read about explorers who ventured into unknown territories. A new picture book biography by the author of Planting the Trees of Kenya will introduce students to explorer, Sylvia Earle. Earle didn't explore land or space; she ventured into the depths of the ocean. 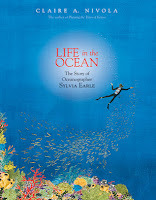 Life in the Ocean by Claire A. Nivola highlights Sylvia Earle's career as an oceanographer. The story begins with a young Sylvia who observed the natural world. She spent countless hours exploring the outdoors near her home in New Jersey. When her family moved to Florida, a whole new world opened up to Sylvia. She was immediately drawn to the ocean. Sylvia swam with goggles so that she could observe underwater life. Nivola then shows readers Earle's many accomplishments using eight small illustrations on a two-page spread. Earle joined expeditions in the Indian Ocean, she led diving teams, she walked on the sea floor while wearing a diving suit, she lived in an underwater laboratory for two weeks, and she explored the ocean in a spherical bubble. Nivola's illustrations capture the beauty of the ocean. One illustration of a pod of whales reflects what Earle learned while diving with the mammals. Whales move all around and swim in all directions. On the following page, deep blues and purples are used to illustrate the ocean depths. Intricate patterns of coral form a border as Earle directs a beam of light onto a school of fish. "We know more about the planets in outer space than we know about the sea on our very own home planet! Sylvia Earle believes that if we do not learn about the ocean world we will never really care about it or take care of it." In an author's note, Nivola goes on to explain the significance of Earle's work in preserving our environment. A selected bibliography provides further reading for kids interested in learning more about the important work of Sylvia Earle. Middle grade readers may want to read Sylvia Earle's autobiography, Dive: My Adventure in the Deep Frontier. Watch a video of Sylvia Earle exploring the ocean in a one-person submarine.